December 12th, 2013 - The public health postings have been removed from Copco Reservoir under the guidance of California's Recommended Threshold for Recreational Waters for Harmful Algae Blooms. September 5, 2013 - KFHAT asks the public to report sick or dead fish in the Klamath and Trinity Rivers by calling 800-852-7550. KFHAT has established an 24-hour hotline through the Office of Emergency Services (OES) Warning Center. The Center staff document public reports and contact KFHAT for further investigation. August 15, 2013 - Lake County officials said they have confirmed elevated levels of algae-related toxins in samples of Konocti Bay water taken following the death of a dog that fell ill after swimming in the bay. July 13th, 2013 - Demonstrators in Klamath Falls earlier this month called attention to an irrigation shut-off in the upper Klamath Basin. The Klamath Basin in California and Oregon comprises an area larger than nine American states. It is famous for its natural beauty and supports farms and ranches as well as tribal homelands and vast wildlife refuges. The basin also is the center of the most contentious and consequential water struggle in the United States. The Klamath Tribes this year exerted their newly affirmed senior rights to the upper basin's water, joining a call for water by Klamath Project irrigators, and several upper basin water shutoffs unwound like a game of Russian roulette. Income will be hobbled, some folks could go out of business. Thousands of migratory birds, meanwhile, have chosen not to land in wetlands that are dried up from drought. And the peculiar hydrology of the basin, hammered in recent years by diminished snowpack levels, defies long-term projection. Weighing in on water issues: Local officials testify at Klamath Basin hearing in D.C.
June 21, 2013 - Local officials present at a Senate Energy and Natural Resources hearing in Washington, D.C., on Thursday came away optimistic, but firm in their convictions that Congress must act now to address long-standing water issues in the Klamath Basin. KFHAT is a technical workgroup which formed during the summer of 2003 with the purpose of providing early warning and a coordinated response effort to avoid, or at least address non-hazardous materials related fish kill event in the Klamath River basin below Iron Gate dam. To accomplish this goal, KFHAT created a network where information about current river and fish health conditions in the Klamath Basin can be quickly shared among participants, the general public, and resource managers. KFHAT utilizes a color coded system of readiness levels to communicate the current conditions in the Klamath River and its tributaries, and the current potential for a fish kill. The readiness levels range from green, no immediate foreseeable problems, to red, a die-off is imminent or occurring. Movement between readiness levels is based upon the best professional judgment of KFHAT members using the most current information on water quality and fishery conditions in the basin. Currently, the readiness level is yellow, signaling the need for heightened awareness and frequent communication of river and fishery conditions. The decision to move to yellow was based upon the unprecedented 2012 estimated run size of over 380,000 salmonids expected to enter the Klamath River. To give some perspective, the in-river run size in 2002, when the fish kill occurred, was 161,000. The predicted returns may be the highest on record (record began in 1978). Because of varying weather conditions in the Klamath Basin and the predicted large salmonid return, KFHAT members will be constantly monitoring the river and fishery this season to alert resource managers if it appears that fish health is deteriorating. In addition, the Trinity River flow group is conducting advance planning to determine ways to keep flows in the Klamath estuary above 2,800 cfs this fall. You can find KFHAT’s readiness levels and more information about the technical workgroup at http://www.kbmp.net/collaboration/kfhat. Ecosystem restoration is a two way street; it aims to improve environmental conditions which in turn provides resilience to local communities. Resilient ecosystems benefit everyone because they provide clean air, clean water, wildlife, and beautiful places to live and play. Restoration efforts in the last 30+ years have been successful in addressing point-source pollution such as manufacturing effluent and mine tailings. The current challenge land managers and local communities face are non-point source pollution which varies temporally and spatially. Non-point source pollution is the Nation’s leading source of water quality problems, leading to degradation of water quality and associated wildlife and public uses (USEPA). 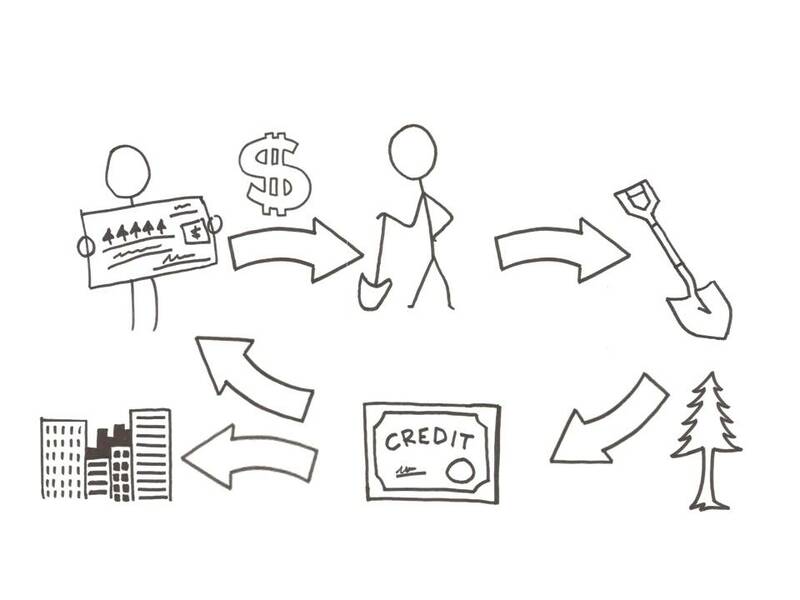 To answer this challenge, communities are developing innovative ways to value ecosystem services known in the economic world as Payments for Environmental Services (PES). PES is a form of environmental accounting which provide “private incentives to achieve social-policy objectives” (Ferraro 2011). This kind of market-based approach gives land owners and managers the potential to generate revenue from the “products” of restoration, like improved water quality. It allows point sources, like industry, municipalities and waste water treatment centers, to invest in restoration efforts to “offset” or satisfy their regulatory obligations. The combined effect is a shift in investment from engineered to natural systems, put another way, it moves money from gray to green infrastructure. To buy and sell the ecological benefits of restoration, PES and other market-based programs need a way to quantify and track project performance, an accounting system for natural capital. Building this kind of ecosystem accounting system requires stakeholders, often organized into “Working Groups,” to identify watershed goals (e.g. meet regulatory obligations like TMDL compliance), provide a road map for those who want to participate and design a monitoring framework that will track that improvements are occurring at the watershed level. The system itself needs to include evaluation of baseline and post-restoration conditions to quantify water quality credits (tradable units of environmental benefit), verification by an independent third-party, and a database registry to track credits over time and allow for public and private investment. The ultimate goal of environmental accounting in the watershed context is to increase the pace and reduce the cost of implementing water quality improvement goals. It allows for a regional approach with flexible priorities to create cumulative and yearly benefits for the entire watershed. The Willamette Partnership has created a dynamic ecosystem service accounting system which quantifies impacts and benefits of a variety of land management and restoration practices which can be verified and tracked as ecosystem service credits. The Willamette Partnership is a coalition of diverse stakeholders using ecosystem service accounting to bring a diverse range of interests together. Their objective is to create positive watershed impacts in the Willamette River basin in Hillsboro, OR. In 1996, Governor Kitzhaber appointed a 22 person task force to develop ways to create and implement effective protection and restoration strategies for the Willamette River basin. A watershed plan was drafted including water quality and habitat restoration goals, prioritization of proposed improvement locations, and a community network to begin project discussion. The Willamette Partnership was created and focused on developing market-based tools that would compliment regulatory mandates and speed up the restoration implementation process. They also created a credit registration database which is a publically transparent way to track how credits are “spent” and invested. The Willamette Partnership has implemented multiple restoration projects and has become a leader in assisting other basins develop their own environmental accounting programs. (For more information the reader is referred to http://willamettepartnership.org). With the help of the Willamette Partnership, the Environmental Protection Agency, The Nature Conservancy, Klamath Basin Rangeland Trust, PacifiCorp, Klamath Watershed Partnership, Oregon Department of Environmental Quality, North Coast Regional Water Quality Control Board, Oregon Watershed Enhancement Board, Watercourse Engineering, National Wildlife Foundation, Environmental Incentives, and the Klamath Basin Monitoring Program an ecosystem service accounting is currently being proposed in the Klamath basin as a tool to improve and protect basin-wide beneficial uses. The working group, Klamath Tracking and Accounting Program (also known as Klamath TAP) was created in 2010 to begin discussions on how to implement an environmental accounting program in the Klamath basin. The Klamath basin is interconnected with water quality goals such as TMDL compliance and mandates nutrient, fish recovery plans, and restoration strategies outlined by the Klamath Hydroelectric Settlement Agreement and the Klamath Basin Restoration Agreement. The Klamath TAP program’s ultimate mission is to actively support restoration efforts in the Klamath basin. The program is interested in improving stream temperature and reducing eutrophication pollutants in the Klamath. Specific pollutants include nitrogen, phosphorous, temperature, biological oxygen demand (organic matter) and dissolved oxygen. The Klamath TAP is a transparent and adaptive management platform which provides a standard set of protocols to identify basin-wide goals, restoration efforts, credit calculations and verifications, and an accounting database to connect credit consumers with credit producers. The program will be an ongoing effort; using the best available science which will inform future investment and policy decisions. You will find Klamath TAP’s vision document, pilot project agreement letter signed my supporting organizations, and an introduction webinar on the KBMP website at http://www.kbmp.net/collaboration/klamath-tap. Want to get involved with water quality restoration efforts in the Klamath Basin? The Klamath Basin Rangeland Trust’s mission is to address water quality and water allocation concerns in the Klamath Basin through cooperative partnerships with private property owners and government agencies. KBRT has focused its efforts since 2002 through four primary activities: to enable landowner participation in Federal and State sustainable management programs, conduct research and monitoring programs to assess management options, implement restoration and conservation projects to enhance aquatic and wildlife habitat, and increase and protect instream flows to improve water quality in Upper Klamath Lake. KBRT has recently collaborated on restoring reaches of Sevenmile Creek (pictured right), which is a direct tributary to Upper Klamath Lake. The diversion located at the Upper Sevenmile Ditch historically dewatered more than 2 miles of stream that is designated as critical habitat for endangered bull trout and is known to provide important habitat for native redband rainbow trout (Oncorhynchus mykiss gairdneri) and Oregon spotted frog (Rana pretiosa). KBRT partnered with the JaCox Ranch starting in 2004 to lease their Sevenmile Creek irrigation water rights to increase instream flow. This restored 41% of the natural flow to this system (16 cfs in the early irrigation season, dropping down to 8-9 cfs in late summer), restoring hydrologic connectivity and migratory corridors for the species of interest. Habitat monitoring has demonstrated that the increased flow to the project has significantly improved ecological function. For example, the Wood River Valley Aquatic Habitat Study Final Report (Matthews 2008) stated that in this reach “fish habitat greatly improved as shown by increased pool numbers, pool quality, pool depth, large woody debris, and presence of gravel substrate” (Pg. 12). 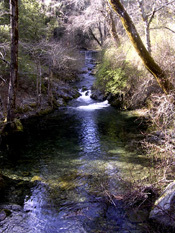 The Wildlife Sevenmile Creek Fish Survey and Limiting Factor Analysis scoping document (ODFW 2005) states that “The highest catch of trout in terms of fish per hour was Sevenmile Creek above the Blue Springs confluence. In the recent past this reach had very little flow during the summer due to the large irrigation diversion ditch upstream. In 2004, JaCox Ranch signed up for the KBRT water bank which dedicated more than 7 cubic feet of water downstream of the diversion in Sevenmile Creek. This reach also had the most species diversity and had the highest occurrence of redband trout.” (Pg. 1). Additional benefits of this project include increasing the volume of water supplied to Upper Klamath Lake, increasing flows in the entire 17 mile reach below the point of diversion, and reducing water temperature in Sevenmile Creek. On a long term basis, this project is also expected to provide critical refugial habitat for the listed species as the watershed is increasingly impacted by climate change. The stream reach is fed in large part by a series of cold water springs, which help to maintain a steady baseflow in the stream year round. The water supply in the springs is from groundwater, insulating the streamflow from snow pack variability and helping to provide important high-quality water to the wildlife refuge downstream. The UC Davis Center for Watershed Studies has identified Sevenmile Creek and other spring-fed tributaries to Upper Klamath Lake as important refugia that will be retained under projected climate change scenarios, while refugial springs lower in the system may be lost. KBRT is currently working with the JaCox Ranch to permanently transfer these important water rights to instream flow. The transfer is expected to be completed in 2013. For more information about Klamath Basin Rangeland Trust please visit our website at www.kbrt.org. The Klamath River Basin has seen an impressive number of restoration and conservation projects in the last ten years, from levee breaches and wetland habitat creation in the Williamson River delta to dryland ranching operations in the Wood River Valley. Potential future projects under the Klamath Basin Restoration Agreement (KBRA) include greater inflows to Upper Klamath Lake and limits on diversions from the Klamath River. Many of these projects are aimed at restoring water quality and reducing nutrient inputs to Upper Klamath Lake. However, there remains a need to relate existing restoration projects and programs to water quality benefits at a watershed scale, and to identify what future efforts will yield the greatest benefits cost-effectively. This collaborative, basin-wide approach to water quality goals is at the foundation of the Klamath Basin Monitoring Program (KBMP), and is shared by many agencies and individuals throughout the Klamath. A strategic approach to assess water quality benefits must also consider how benefits may change with future climate in the region. However, changes predicted by regional climate models may alter future patterns of water availability and quality in ways that are difficult to forecast. Climate scenarios for the Klamath Basin predict summer air temperature increases of 1.2 -2.7 oC over the next 20-30 years and 3.2-6.6 oC increases by 2075. Changes in precipitation are less certain; but, snowpack is expected to decline and summers are expected to be drier than they currently are (Koopman et al. 2009). The potential impacts to regional water quality and endangered fish populations from climate change are as yet not well understood, and are on important component for restoration activities and goals. A strategic approach can also inform managers of the degree of success of conservation programs and restoration efforts, maximize the effectiveness of implemented conservation projects, and help guide future conservation planning. As part of the U.S. Department of Agriculture (USDA) Conservation Effects Assessment Project, modeling is planned to determine the effects of management and restoration on water quality in the Upper Klamath Basin. The anticipated final products from this project include an interactive model platform that will allow users to identify cost-effective conservation, and restoration activities with maximum water quality benefits in the Upper Klamath River Basin under a variety of climate change scenarios. The project research team includes Rosemary Records, a Master of Science student at Colorado State University (Geosciences department), recent graduate of Humboldt State University and one-time eastern Oregonian; Walter Duffy and Sharon Kahara of the California Cooperative Fish and Wildlife Research Unit at Humboldt State University; and Colorado State University researchers Mazdak Arabi (Civil and Environmental Engineering) and Steven Fassnacht (Geosciences). Team background includes research in hydrologic and water quality models; snow processes and climate change; and fisheries and wetland ecology. Elements of the project include: 1)l develop, calibrate and validate (tune) a Soil and Water Assessment Tool (SWAT) water quality model for the Sprague River in 2012; and 2) expanding work to include the Williamson and Wood Rivers, using the SWAT model linked to regional groundwater models in 2013 and 2014. The SWAT model is a spatial, continuous simulation model developed by the USDA Agricultural Research Service (USDA-ARS) designed to quantify management and land use effects on water quality parameters in agricultural landscapes, including water discharge, sediment yields, and nutrient loading. The model may be used to compare the relative contribution of specific parts of the watershed or of specific land uses to flow, sediment and nutrient loads within a basin. SWAT has been successfully used to determine short- and long-term impacts of best management practices (BMPs) and wetland restoration on sediment, nitrogen and phosphorus throughout the world (Available: http://swatmodel.tamu.edu/ ). Previous SWAT models for the region have shown that the model performs well for the Sprague River. The Project will improve on these prior efforts with highly detailed land use and conservation practices data; state-of-the-art climate scenario interpretation methods; and optimization tools developed specifically to guide management decisions for nonpoint water pollution. First, estimate historic and current sediment and nutrient loading to the three river systems; model scenarios will illustrate how past climate and changes in land use practices have influenced loading rates and water quality. Second, predict reductions in nutrient loading to the Sprague, Williamson and Wood Rivers that may be realized with WRP or other wetland restoration and BMPs, under various climate change scenarios. Third, evaluate the spatial location of restored wetlands BMPs within these watersheds that would result in the greatest water quality improvement (project optimization) using model scenarios. Current work is focused on assessing current and potential future effects of USDA restoration and BMPs; however, models will be capable of assessing watershed-scale water quality effects of conservation and restoration practices regardless of the implementing agencies. Models will be the basis for tools to assess how restoration strategies and BMPs may be strategically implemented to meet basin-wide water quality goals (such as those identified in recent TMDLs), while balancing relative costs and long-term performance under climate change. Further analysis will provide an estimate of the uncertainty in model estimates so that users may better interpret model results. While models are useful tools, accurate predictions are impossible without extensive, high-quality data for model development (ensuring certain processes, such as wetland nutrient cycling, are realistically represented) and model tuning (calibration and validation). The team appreciates the efforts of Chantell Krider, Lea Bond, Kris Fisher, KBMP partners, and Klamath Basin agencies and individuals too numerous to mention for generously sharing data for model development, calibration, and validation. Their hard work has provided the team with over a decade of detailed water quality data throughout the Upper Klamath Basin which will substantially improve model predictive capabilities. Modeling results for the Sprague River are anticipated to be completed in fall of this year, and the final report will be circulated to those who have participated in the project or who would simply like to receive updates on the project. The Project Team hopes to continue to work with KBMP and its partners to coordinate our research with existing efforts, and to ensure that our work effectively addresses science and management needs in the Upper Klamath Basin. We look forward to working with KBMP and partners into the future, and we greatly appreciate your support. 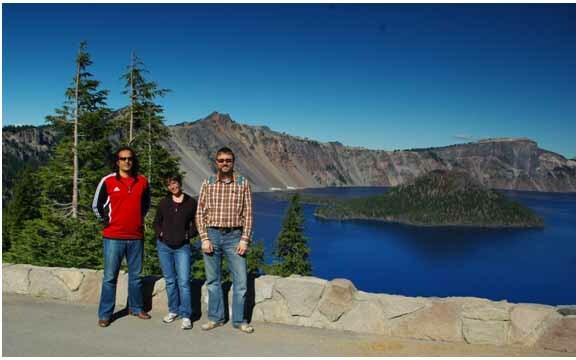 Crater Lake, October 2011: from left to right, Mazdak Arabi, Rosemary Records, and Steven Fassnacht. 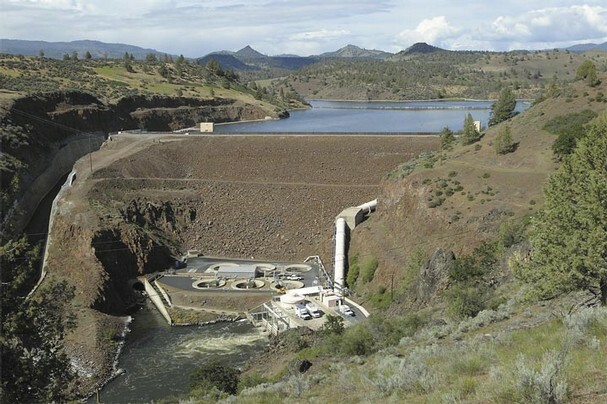 Based on a science panel evaluation and other information, the U.S. Secretary of the Interior will determine whether removal of four dams on the Klamath River will help restore salmonid fish to the Klamath Basin and whether dam removal is in the public interest. The four independent science panels' evaluation is based on population studies of 1) lamprey (eel-like fish), 2) coho salmon and steelhead trout, 3) Chinook salmon, 4) resident fish including trout and suckers under two scenarios: A) if the four dams on the Klamath remain, and B) if the dams are removed. The team assembling new and existing studies to inform the decision will also follow guidance from the White House Office of Management and Budget on scientific peer review, using a system of checks and balances to gain the best understanding possible of the costs and benefits of potential dam removal, the decision is currently scheduled for Summer 2012. The mission of the Watershed Research and Training Center is to promote a healthy forest and a healthy community. Since 1995 the WRTC has been working to revitalize the economy of Hayfork, CA, a small town in the middle of the Shasta-Trinity National Forest. Prior to 1996, Hayfork's economy was driven by timbering and the USFS jobs that accompanied that industry. The turmoil and transition of adopting the NW Forest Plan changed the way our local federal lands were managed, contributing to the loss of 40% of Hayfork's payroll. The WRTC was formed in order to rebuild our economy based on an ethic of land stewardship and restoration. To those ends, we've re-trained woods workers, built local contracting capacity, engaged in fuels reduction in the WUI, led local collaborative efforts, and are working with partners to develop and implement landscape-scale restoration strategies across the Klamath-Siskiyou bioregion. For over ten years we focused our efforts on restoring the Trinity Forest while developing local wood products enterprises as a means to create local jobs and instill stewardship values in our community. More recently, we've broadened our focus to include fisheries and watershed restoration. We are investigating how ecological and social needs can be met in the context of watershed management. We have engaged in numerous watershed planning projects over the past four years, building our capacity for watershed restoration work. Those projects include writing An Integrated Management Plan for Hayfork's Municipal Water Source, post-fire stream condition inventories and monitoring in a number of South Fork Trinity River tributaries, and a comprehensive look at the affects of the Miners Fire (2008) on the Lower Hayfork Creek watershed. More recently we have begun collaborating with state agencies in collecting water temperature data and fisheries data within the South Fork Trinity River basin. On April 27th, 2010 the Klamath Basin Monitoring Program (KBMP) membership convened for their annual spring meeting at Humboldt State University. On the agenda for the day was the proposal to adopt the Klamath Basin Water Quality Monitoring Plan, a comprehensive monitoring strategy that unites all water quality monitoring entities under a single plan. The members voted unanimously in favor of the monitoring plan. The adoption of the Klamath Basin Monitoring Plan signifies a significant step toward a comprehensive and coordinated water quality monitoring effort throughout the Basin. The monitoring plan encompasses the entire 10.5 million acre Klamath Basin, with over 10 participating organizations. Included in the monitoring plan are baseline water quality analytes and special studies that are designed to capture water quality impacts to sensitive beneficial uses, such as cold water fisheries, endangered species, contact recreation, and cultural use. The monitoring plan is also designed to align with the recently adopted Klamath River TMDL and Upper Klamath and Lost River TMDL, which is currently underdevelopment. The drafting and development of monitoring plan was a two year process. The process began with the development of the Klamath Basin Monitoring Program, which formalized interagency partnerships. Historically, members of the various water quality organizations collaborated on an informal level, exchanging information and collaborating in an effort to reduce duplication and effort. After many years of informal meetings, participating members of the KBMP attempted to formalize. However, due to the complexity and severity of the problems facing the Klamath Basin, and the decreasing level of available resources at all levels, the group failed to solidify. In 2006 the U. S. Environmental Protection Agency and the California Non-Point Source Program proposed a contract to facilitate the development of a coordinated monitoring and assessment plan within the Klamath Basin. The contract, managed by the North Coast Regional Water Quality Control Board and executed by the Klamath Watershed Institute, consisted of several key tasks: facilitation of KBMP meetings, development of website / web-portal for sharing information and data, creation of a communications plan, and the development of the Klamath Basin Water Quality Monitoring Plan. The rationale behind the development of the Plan was to 1) create a comprehensive and inclusive monitoring strategy; 2) develop effective and efficient way of using resources; 3) generate a holistic picture of the health of the basin; and 4) create interagency partnerships to improve the health of the basin. The Plan is not intended to replace individual water quality monitoring efforts or autonomy, but to expand coordinated monitoring in a way that benefits long-term coordination and collaboration among organizations. The Plan is also intended to be developed in phases, the current version represents phase one of the multiphase process. Still underdevelopment are a set of minimum QA guidelines, aimed at enhancing collaborative and comparable sampling. The Klamath Basin Monitoring Program is currently seeking funding for full implementation of the monitoring plan and strategic plan.